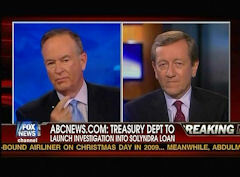 On Tuesday and Wednesday's World News, reporter Brian Ross exposed e-mails indicating that the Obama administration gave a $535 million loan to the green company Solyndra, despite deep misgivings inside the government about its viability. Yet, Good Morning America has declined to follow-up on the ABC scoop. GMA completely ignored the story, failing to even mention it in a news brief. The morning show did, however, find time to devote over five minutes to the divorce of reality TV star Michaele Salahi. While his own network minimized the new developments, Ross was able to explain the details on Wednesday's O'Reilly Factor. He warned that the controversy goes "right to the door of the White House. New e-mails that came out today at a congressional hearing revealed the pressure put on people inside the White House to move up the timing" of the loan. Ross told Bill O'Reilly that he was stunned to learn that "early in the year, the White House became aware the company was about to go bankrupt. Now, the government, the White House told us and the company told people in Congress, everything was great, rosy projections at a time they knew they were running out of cash." Ross was allowed to cover the story on the September 13 and 14 World News. On Wednesday, he informed, "It was also revealed today that even though administration officials knew the company was facing bankruptcy, they agreed to restructure the loan so that in case the company did fail, the first $75 million recovered would go not to taxpayers but to the private investors..."
However, in addition to skipping the news on Thursday's GMA, Tuesday and Wednesday's Nightline also ignored the story. (GMA did cover earlier developments back on September 1, 2011.) Generally, networks are proud of their scoops. World News anchor Diane Sawyer introduced Ross by informing that this ABC journalist "broke the story." DIANE SAWYER: Good evening to you. We begin tonight with the White House on the hot seat over a story we broke right here on ABC News. Did a half billion dollars of your taxpayer money go to a company certain to fail? And why? Members of Congress called the White House on the carpet today and ABC's chief investigative correspondent Brian Ross, who broke the story, tells us those new twists today. REP. BRIAN ROSS: More than $500 million dollars in taxpayer money was given to the now bankrupt company, and no one today was taking responsibility for it. TIM MURPHY: You tell me what you're gonna to tell the taxpayers. ROSS: Administration officials in front of Congress dodged tough questions about Solyndra, saying such problems can be expected with start-up companies and that no one was to blame. MURPHY: We're in the hole for so much money in this country and you're dealing with this in a very casual, cavalier way. Whose fault is it? JOHNATHAN SILVER (DEPARTMENT OF ENERGY LOAN CHIEF): Well, sir, first, let me see that the 200 odd professionals working in the loan guarantee program are exceptional professionals. MURPHY: And you throw them all under the bus, it's a pretty bumpy ride, but you're the driver, Mr Silver. You're the driver. ROSS: New E-mails show the California company got its $535 million loan despite deep misgivings inside the government. The "issue of working capital remains unresolved," wrote a Department of Energy official just weeks before the loan was approved in 2009, warning accurately, Solyndra "runs out of cash in September 2011." The company filed bankruptcy on September 6th, 2011. Other e-mails detail the rush by the White House to get the Solyndra loan approved by a scheduled groundbreaking that included a video appearance by Vice President Biden, with a promise of new jobs. JOE BIDEN: Which is why it's so important we invest in Solyndra. BRIAN ROSS: Behind the scenes, senior White House staff were telling the budget office, "if there is any way to accelerate, would give a lot of peace of mind, flexibility on that front." But a White House budget analyst complained, "We would prefer to have sufficient time to do our due diligence reviews and have the approval set the date for the announcement, rather than the other way around." This year, even as Solyndra approached bankruptcy, the company and the White House kept it secret, telling Congress and the workers everything was going great until the day it shut its doors. FORMER EMPLOYEE: You walk into your company and the doors are shut. Just picture that. ROSS: In Congress today, members said they want to know why they were misled about Solyndra's financial state. REPRESENTATIVE DIANA DEGETTE (DEM) (ENERGY AND COMMERCE COMMITTEE): How they could be in my office in July telling me things were looking better and filing for bankruptcy two months later.